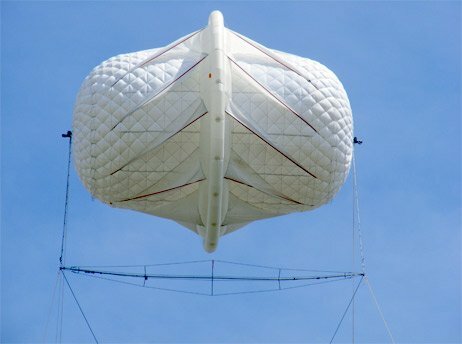 New Windmill: Magenn Air Rotor System uses lighter than air technology to float above a Denver home needing no pole or tower. When we think of renewable energy for our Denver homes, our first thought is probably of solar panels on the roof. But, new technologies are beginning to become viable for use here and throughout Colorado to help replace or eliminate the electricity bill. Consider fuel cells and even home wind technology for example. Solar technology improves continually, The efficiency of photoelectric cells has recently more than doubled. The highest efficiency cells, not yet on the market, are now 41.4% efficient. The cost of solar panels has dropped by 50% since 2007, according to Reuters’, and will continue to drop in the near future. Rebates, tax incentives and no money down leases make these systems more affordable and coming technology like solar shingles and spray on solar film my make it even more attractive. Solar electric technology gets most of the spotlight but there are other alternatives available now or in the near future. Fuel cells, like the Bloom Box, are becoming more common as they are mass produced and the price drops. Bloom Box claims they will soon market a fuel cell that will power an average American home for $3000. The fuel cell will use many common forms of fuels like natural gas, diesel and biofuels. The always available feature of fuel cells means that it will be easy to get off the grid. Peizo electric devices produce electrical current when they are physically stressed. In Japan a train station uses the pressure of foot traffic through turnstiles to produce electricity in a test to determine the reliability of the system and how much electricity can be produced. An Israeli company is testing peizo electric roads. Their system will produce power from the impact of cars driving on the surface. They believe that less than 1 mile of four lane highway can produce enough power for 2500 homes. Piezo electric clothes will power personal electronics in the future. Aerovironment has built in towers and is just tipped into place on delivery. A technology that is often overlooked for home use is wind turbines. Wind turbine pricing has gone down in the past few years. There are many small wind turbines available that can supply an average home with all their energy needs for the cost of a few years of gas and electric bills. Helix Wind makes these unobtrusive pole turbines to capture wind energy at home. Most of us have only seen wind turbines with huge aircraft like wings mounted on high towers or posts. Few people want these monsters in their back yards, but newer, smaller wind turbines are being made around the world that are increasing efficient, affordable and artistic. In areas, like the Colorado mountains and plains wind turbines can be a viable choice. 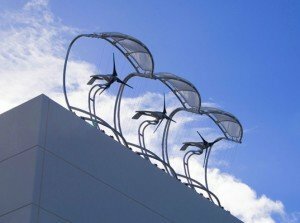 Denver has enough wind that a downtown night club has installed wind turbines to supplement power for daily operations. Wind flow through urban areas is deflected and channeled by buildings creating patterns that make it difficult for traditional wind generators to work. Newer designs allow turbines to be driven by shifting winds from all directions. Some of these units can be mounted directly to roof tops. Most small, single home turbines can be mounted on the top of a telephone pole. Wind turbines can be works of kinetic art. Searching for images of “urban wind turbines” brings results that might surprise you. This is where art meets technology to produce beautiful and practical works of art that pay back daily. Newer wind turbines for Colorado solve the ugly factor involved in installing renewable energy sources in your home. These systems are quiet, reliable, bird friendly and getting cheaper. Small wind turbine technology will continue to improve and drop in price. It is an alternative worth considering if you live in a place where the wind blows a sufficient amount of time. Contact your local alternative energy contractor or green technology school for information. But, if you need a good home inspection, contact me on the form below. 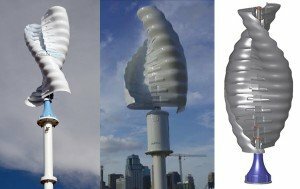 Interesting about the “urban wind turbines,” I had never seen those before. I have been personally curious about gaining more independence and breaking off from city utility dependence, the solar options are not very practical in Alaska but the wind is definitely useable up here. Great article! I had assumed that most Colorado weather was similar to our climate, looks like perhaps not though seeing how you mention the different types of solar power. Ours would be covered up by the snow, and it would take a massive battery cell to store solar power that was generated in the sunny summer months. I would be curious to find out if something like that were available, or even efficient. It’s great to see the advancement in technology. We are now starting to see completely green neighbor developments in the Eugene Oregon area. The cooler the technology gets the more we’ll hear clients asking for it. These new wind turbines are probably the most impressive new technology I’ve seen in this field. Making it available for consumers is a huge step in the right direction. Certainly, but people need to appreciate that adding Solar in their house is an purchase that should improve the longer term valuation of their house if / when they make a choice to sell. With the environment the way it is going we are not able to disregard any system that provides zero cost energy at no cost to both the buyer and more notably the earth!